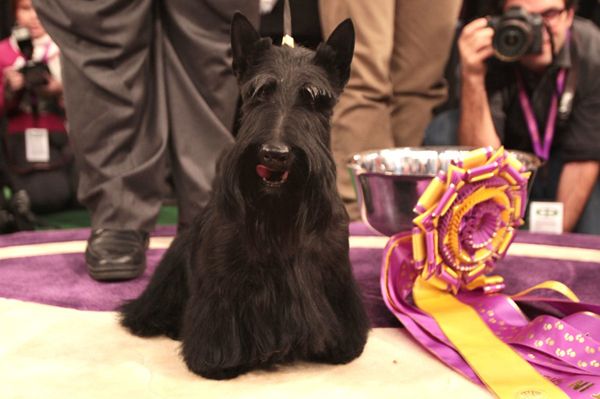 Each year, the title of “Best in Show” is awarded to a dog chosen as the winner of the Westminster Kennel Club Dog Show. The title has been awarded every year beginning in 1907 except for in 1923, when changes in the American Kennel Club rules prohibited mixed breed judging until members could agree on a uniform process. One of the most coveted honors in dog showing, the prizewinning dog gets to go home with the esteemed title and a cash prize. However, some breeds win more often than others—much more often, as it turns out. The below breeds have won “Best in Show” more times than other dog breeds to have competed in the Westminster Kennel Club Dog Show. Airedale Terrier; Airedale Terriers are the largest of the terrier group. The breed is strong, curious, athletic, and compassionate, standing around 23 inches tall and outfitted in a dense, wiry coat. The Airedale Terrier has been a favorite among U.S. presidents for their intelligence, ability to learn, and loyalty. These regal, muscular, and well-trained dogs have won the coveted “Best in Show” four times: 1912, 1919, 1922, and 1933. Smooth Fox Terrier; This lively, personable terrier was originally developed to aid in and accompany individuals on Britain’s traditional foxhunts. Close relatives of Wire Fox Terriers, these furry companion animals are friendly, independent, and endlessly amusing. They are relatively small, standing at just 15.5 inches and weighing around 18 pounds, but they can live to be fifteen years old. Smooth Fox Terriers have won “Best in Show” four times in a row: in 1907, 1908, 1909, and 1910. English Springer Spaniel; English Springer Spaniels are known for their friendly, obedient, and playful temperaments. These lovable dogs are full of energy and possess endless intelligence. They were bred to work closely with humans, making their appearance on this list relatively unsurprising. English Springer Spaniels have won the “Best in Show” title a total of six times: 1963, 1971, 1972, 1993, 2000, and 2007.